A web hosting is a service that allows organizations or individuals to make their own website live on internet. It allows your website to be assessable on the Internet. The website itself is being hosted on a web server most often located in a specialized data center. The web server offers uninterrupted Internet connectivity, a certain set of software packages, which offer additional services such as e-mail, ftp, databases, as well as an environment for utilizing different programming languages such as: perl, php, java, xhtml, html and others also CMS like WordPress, Joomla, Drupal, etc. Web hosts are companies that provide space on owned or leased server to their clients. Most hosting providers provide Linux-based web hosting which offers a wide range of different software. Atypical configuration for a Linux server is the LAMP platform: Linux, Apache, MySQL, and PHP/Perl/Python. A customer may also choose windows as the hosting platform to use ASP .NET or Classic ASP. The customer still can choose from PHP, Perl and Python. Many web hosting services provide space free of charge. Usually these companies provides subdomain as subdomain.maindomain.com or they may create a directory like websitename.com/yourdirectory. 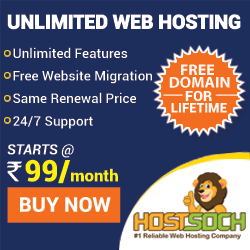 These type of web hosting have some limitations and usually used for creating a blog but not for business purpose. In this type of server many websites resides on one web server connected to internet. Each of the website is given separate section to separate them from other website. This type of web hosting is also referred as derive host as well as virtual hosting service. A web hosting reseller is someone who sells web hosting. Companies having their own a dedicated server or have bought a reseller hosting plan from another web hosting provider. It is very much economical for companies dealing with many clients. A virtual private server (VPS), also called virtual dedicated server (VDS), is a server that appears to the user as a dedicated server but is actually installed on a computer serving multiple websites. A single computer can have several VPSs, each one with its own operating system that runs the hosting software for a particular user. The hosting software for each VPS can include a web server program, a File Transfer Protocol (FTP) program, a mail server program and specialized applications for activities such as e-commerce and blogging. Dedicated hosting is simply a server located in data center somewhere in which you have complete control over and hence is “dedicated” only to you. The data center will usually have network operations staff that will be able to assist you with some basic functions, such as resetting the server or upgrading hardware, firmware, operating system systems and more, however, in general a web developer or system administrator is in charge of the server. Web Hosting basic knowledge of web hosting, types of web hosting, web hosting guide, what is web hosting. permalink.